Greetings!!! from the "BSHRM-NSU 8th International HR Conference 2019" committee members. Date: 19 April (Friday) 2019. Venue: NSU Auditorium, A world class auditorium at NSU Campus, Bashundhara, Dhaka. This year we deliberately choose our conference theme as "HR Leadership for Emerging Economy" and our focus is "Perspective Bangladesh". 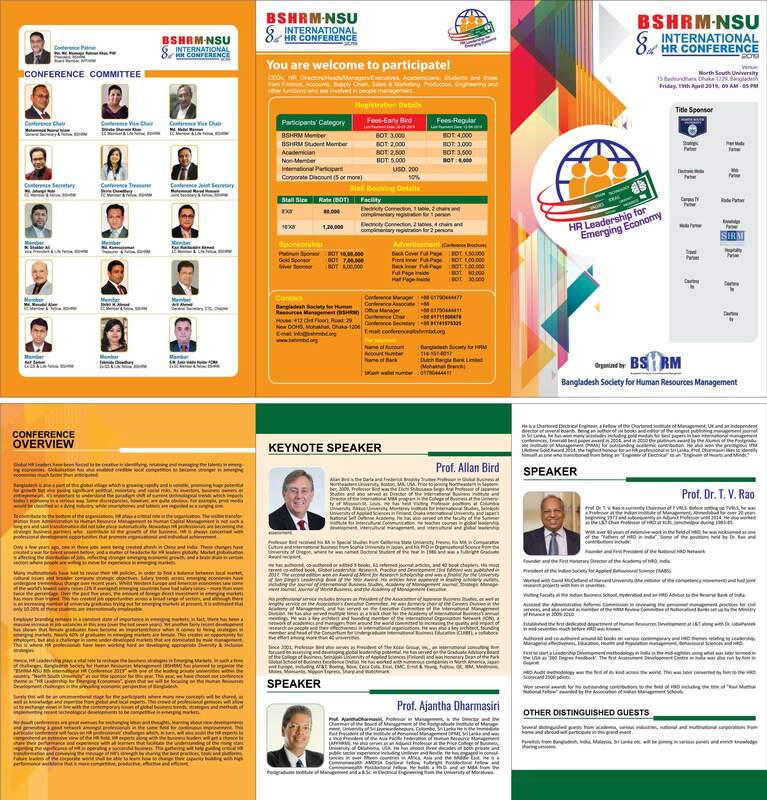 Please find attached, initial Conference Flyer, for your individual consumption only ( not for publicly distribution) to get relevant information on "BSHRM-NSU 8th International HR Conference -2019". You may receive phone call/communication from our BSHRM fellows, who voluntarily took the responsibility in their shoulder to serve our BSHRM in this regards. Feel free to contact with the respective committee members for any further support and assistance. We are pretty open to get in touch with you my dear respected fellows at BSHRM. Thanking you in advance for your continuous support to your BSHRM, as your did for long.